Author contributions: Muscarella LF contributed to this paper. To evaluate the risk of transmission of carbapenem-resistant Enterobacteriaceae (CRE) and their related superbugs during gastrointestinal (GI) endoscopy. Reports of outbreaks linked to GI endoscopes contaminated with different types of infectious agents, including CRE and their related superbugs, were reviewed. Published during the past 30 years, both prior to and since CRE’s emergence, these reports were obtained by searching the peer-reviewed medical literature (via the United States National Library of Medicine’s “MEDLINE” database); the Food and Drug Administration’s Manufacturer and User Facility Device Experience database, or “MAUDE”; and the Internet (via Google’s search engine). This review focused on an outbreak of CRE in 2013 following the GI endoscopic procedure known as endoscopic retrograde cholangiopancreatography, or ERCP, performed at “Hospital X” located in the suburbs of Chicago (IL; United States). Part of the largest outbreak of CRE in United States history, the infection and colonization of 10 and 28 of this hospital’s patients, respectively, received considerable media attention and was also investigated by the Centers for Disease Control and Prevention (CDC), which published a report about this outbreak in Morbidity and Mortality Weekly Report (MMWR), in 2014. This report, along with the results of an independent inspection of Hospital X’s infection control practices following this CRE outbreak, were also reviewed. While this article focuses primarily on the prevention of transmissions of CRE and their related superbugs in the GI endoscopic setting, some of its discussion and recommendations may also apply to other healthcare settings, to other types of flexible endoscopes, and to other types of transmissible infectious agents. This review found that GI endoscopy is an important risk factor for the transmission of CRE and their related superbugs, having been recently associated with patient morbidity and mortality following ERCP. The CDC reported in MMWR that the type of GI endoscope, known as an ERCP endoscope, that Hospital X used to perform ERCP in 2013 on the 38 patients who became infected or colonized with CRE might be particularly challenging to clean and disinfect, because of the complexity of its physical design. If performed in strict accordance with the endoscope manufacturer’s labeling, supplemented as needed with professional organizations’ published guidelines, however, current practices for reprocessing GI endoscopes, which include high-level disinfection, are reportedly adequate for the prevention of transmission of CRE and their related superbugs. Several recommendations are provided to prevent CRE transmissions in the healthcare setting. CRE transmissions are not limited to contaminated GI endoscopes and also have been linked to other reusable flexible endoscopic instrumentation, including bronchoscopes and cystoscopes. In conclusion, contaminated GI endoscopes, particularly those used during ERCP, have been causally linked to outbreaks of CRE and their related superbugs, with associated patient morbidity and mortality. Thorough reprocessing of these complex reusable instruments is necessary to prevent disease transmission and ensure patient safety during GI endoscopy. Enhanced training and monitoring of reprocessing staffers to verify the proper cleaning and brushing of GI endoscopes, especially the area around, behind and near the forceps elevator located at the distal end of the ERCP endoscope, are recommended. If the ERCP endoscope features a narrow and exposed channel that houses a wire connecting the GI endoscope’s control head to this forceps elevator, then this channel’s complete reprocessing, including its flushing with a detergent using a procedure validated for effectiveness, is also emphasized. Core tip: Gastrointestinal (GI) endoscopy, particularly ERCP, is an emerging risk factor for transmission of carbapenem-resistant Enterobacteriaceae (CRE) and their related superbugs, as well as of other certain bacteria and viruses. Several recent reports associate outbreaks of CRE following ERCP, with associated morbidity and mortality. If performed properly, however, current practices for reprocessing GI endoscopes, which include high-level disinfection, appear adequate to prevent disease transmission. Enhancing the quality and safety both of infection control in GI endoscopy departments and of the design of GI endoscopes to facilitate their thorough cleaning and reprocessing is recommended, as it is reasonable to conclude that these recent outbreaks of CRE causally linked to contaminated GI endoscopes may result in more robust and focused oversight and inspections both of manufacturers by regulatory agencies and of healthcare facilities by healthcare accrediting organizations and state health departments. Along with risk assessments, performing root cause analyses that identify the likely causes of CRE outbreaks and the actions required to prevent their recurrence is encouraged. Common infection control strategies for the prevention of disease transmission during gastrointestinal (GI) endoscopy are routinely credited for the low reported rate of infections due to a contaminated GI endoscope[1-5]. Bacterial and viral outbreaks following GI endoscopy, with associated morbidity and mortality, have been reported (albeit infrequently) during the past 30 years, but the cause of virtually every one of these outbreaks was attributed to one or more infection control breaches - for example, to: (1) an endoscope reprocessing lapse, including the failure to clean the GI endoscope’s instrument channel with a brush; or, the faulty reprocessing of the GI endoscope by an automated endoscope reprocessor, or AER, with a flawed internal design; (2) a damaged or improperly maintained or serviced GI endoscope; or (3) the unsterile administration of an intravenous (iv) medication[6-14]. Cleaning, high-level disinfection, and drying of the GI endoscope, either in strict accordance with the endoscope’s labeling or, alternatively, consistent with any one of a number of recently published endoscope reprocessing guidelines, form the tridental cornerstone of infection control in the GI endoscopic setting. Despite GI endoscopy’s low reported infection rate, endoscope reprocessing lapses confirmed in recent years have resulted in an heightened focus on patient safety in the GI endoscopic setting. And, with the recent emergence of the “superbug” known as carbapenem-resistant Enterobacteriaceae, or “CRE”, infection control in this setting has taken on even more urgency and closer examination[16-31]. Much of this enhanced scrutiny in the United States is a direct consequence of the publication in 2014 of a report by the federal Centers for Disease Control and Prevention (CDC) documenting an outbreak of CRE identified the previous year at a hospital located in a suburb of Chicago, IL (United States), known herein as “Hospital X”[25,31]. Part of the largest in United States history, this outbreak of CRE was investigated by the CDC, which determined that 28 and 10 of Hospital X’s patients had been colonized and infected, respectively, with a strain of CRE. (With colonization, the patient carries or harbors the bacterium without displaying any clinical symptoms of infection or disease. Infection, in contrast, is associated with the patient eliciting clinical symptoms that meet certain criteria. Colonization can, but does not always, result in infection). According to the CDC, each of these 38 patients was exposed to this superbug while undergoing endoscopic retrograde cholangiopancreatography, or “ERCP”, performed by Hospital X between January and September, 2013. (ERCP is a specialized upper GI endoscopic technique that may be used to diagnose and/or treat certain diseases of the biliary or pancreatic ductal systems). The CDC reported its findings in the January 3, 2014, issue of Morbidity and Mortality Weekly Report (MMWR). The Illinois Department of Public Health and the Cook County Department of Public Health, as well as the Food and Drug Administration (FDA), assisted the CDC with this investigation, a testament to the potentially significant impact of this landmark outbreak of CRE on public health, infection control in the GI endoscopic setting, and the regulation of complex reusable medical instrumentation. Determining it to be a reservoir of the outbreak’s strain of CRE and, therefore, presumably responsible for these 38 patient infections and colonizations, the CDC reported that “the terminal section (the elevator channel)” of a side-viewing duodenoscope, also known as an ERCP endoscope, which Hospital X used to perform ERCP on several of these 38 exposed patients, was microbiologically sampled and found to be contaminated with both the outbreak’s strain of CRE, known as New Delhi metallo-β-lactamase-1 (NDM-1)-producing Escherichia coli, and a second strain of CRE[25,31]. Although also cultured from this same ERCP endoscope, however, this second strain, known as Klebsiella pneumoniae carbapenemase (KPC)-producing K. pneumoniae, reportedly did not result in the colonization or infection of any of Hospital X’s patients. An ERCP endoscope not related to Hospital X’s CRE outbreak is displayed in Figure 1A. Most salient, the CDC reported that this implicated ERCP endoscope remained contaminated with the outbreak’s strain of CRE (i.e., NDM-1-producing E. coli) despite this instrument (according to the CDC) having been first manually cleaned and then high-level disinfected using an AER. The CDC further reported in MMWR that it did not identify any obvious breaches in the protocol for reprocessing ERCP endoscopes during its investigation of Hospital X’s CRE outbreak[25-30]. Figure 1 A FujiFilm 530-series duodenoscope and forceps elevator. A: Displayed is a FujiFilm 530-series duodenoscope, also known as an ERCP endoscope. Also displayed is an endoscopic accessory (colored white with green and red strips), which was passed through the endoscope’s working (or instrument) channel and is seen exiting the endoscope’s distal tip); B: Displayed is the forceps elevator of a FujiFilm duodenoscope. This mechanism is also visible in Figure 1A. [Note: Figures 1A and 1B are reproduced by the permission and courtesy of FUJIFILM Medical Systems U.S.A., Inc. ("FujiFilm"). No correlations or inferences should be made linking FujiFilm products to the transmission of CRE, “superbugs" and/or other related antibiotic-resistant microorganisms that may cause infections]. In this outbreak’s aftermath, however, an independent inspection of Hospital X’s infection control practices was performed, and a report published, by The Centers for Medicare and Medicaid Services (CMS), which states that the hospital “failed to reprocess ERCP endoscopes as recommended by the endoscope manufacturer”. Namely, according to the CMS’s inspection report, the endoscope’s manufacturer asserts that Hospital X did not clean the ERCP endoscope using the recommended or approved type of either brush or detergent, notwithstanding the CDC’s failure to identify any obvious endoscope reprocessing errors. The CMS’s inspection report provides three additional facts not reported by the CDC in MMWR: (1) that Hospital X’s CRE outbreak in 2013 was associated with the use of not one, but three ERCP endoscopes of the same model type; (2) that at least two of Hospital X’s 10 patients infected with the outbreak’s strain of CRE died; and (3) that, in addition to the two strains of CRE that the CDC recovered from one of Hospital X’s contaminated ERCP endoscope (i.e., NDM-1-producing E. coli and KPC-producing K. pneumoniae), a third strain of CRE - namely, NDM-producing K. pneumoniae - reportedly infected at least one of these two patients who expired (i.e., “Patient #10”). Indeed, Hospital X’s CRE outbreak therefore documents a rare instance of patient mortality directly linked to a contaminated GI endoscope. The CDC further reported that the ERCP endoscope’s complex physical design “might pose a particular challenge for cleaning and disinfection”. ERCP endoscopes feature a forceps elevator, which is displayed in Figure 1B and is used by the physician during ERCP to manipulate and control the direction and fine movements of accessories that are manually inserted and passed through the GI endoscope’s accompanying instrument channel. Figure 1A displays the passage of an accessory through the ERCP endoscope’s instrument channel. Along with the published findings of the CMS’s inspection of Hospital X, the CDC’s contemporaneously published report in MMWR emphasizing that GI endoscopy is an important risk factor for CRE infections and colonizations inextricably introduces concern and confusion about the safety of GI endoscopy vis-à-vis superbug transmissions. (To date, reports of infections of CRE and their related superbugs have been limited to ERCP and esophagogastro-duodenoscopy, or “EGD”. While CRE transmissions during colonoscopy would presumably be possible, none has been documented to date). Implying causality, the CDC also reported that once Hospital X replaced the automated high-level disinfection of its ERCP endoscopes with ethylene oxide gas (EtO) sterilization, however, no new cases of CRE transmissions due to a contaminated ERCP endoscope were identified[25,29,31]. Indeed, EtO sterilization is more robust than high-level disinfection performed either manually or using an AER (although EtO sterilization is a more time-consuming process that is no longer used in many healthcare facilities). In addition to some other aspects of its CRE outbreak, however, Hospital X’s replacement of automated high-level disinfection, which is a “wet” process requiring that the GI endoscope be subsequently rinsed with (bacteria-free) water following chemical immersion, with EtO sterilization, which conversely is a “dry” low-temperature process that does not use water during any of its stages, to prevent more infections (or colonizations) of CRE might prompt additional speculation about the safety of GI endoscopy and whether current practices for reprocessing GI endoscopes (i.e., high-level disinfection) may not be sufficiently rigorous to prevent transmissions of CRE and other related multidrug-resistant bacteria[26-30]. This may be both the first and most comprehensive article to evaluate the risk of transmission of CRE and their related superbugs during GI endoscopy. It achieves this objective by providing some background information about Enterobacteriaceae, CRE, and β-lactam antibiotics, which include carbapenems to which, as their name indicates, CRE are resistant; by reviewing the recommendations of federal agencies and professional organizations for reprocessing GI endoscopes; and by reviewing, in detail, the CDC’s report published in MMWR and the CMS’s contemporaneously published hospital inspection report, which both discuss Hospital X’s CRE outbreak in 2013 causally linked to contaminated ERCP endoscopes[25,31]. Other instances of disease transmission during GI endoscopy were also reviewed, including several in the FDA’s “Manufacturer and User Facility Device Experience” database, or “MAUDE,” and in the peer-reviewed medical literature. In addition to outbreaks of CRE and their related superbugs following GI endoscopy, these instances document bacterial (and viral) transmissions via contaminated GI endoscopes reported prior to CRE’s emergence. While this article focuses primarily on the prevention of transmissions of CRE and their related superbugs in the GI endoscopic setting, some of its discussion and recommendations may also apply to other healthcare settings, to other types of flexible endoscopes, and to other types of transmissible infectious agents. [Note: In the context of this article “related superbugs” are related to, but are not, CRE, per se. Specfically, they are gram-negative bacteria that are either: (1) resistant to carbapenem antibiotics, although not of the Enterobacteriaceae family (and therefore not CRE; NDM-1 carbapenemase-producing Acinetobacter baumannii and KPC-producing P. aeruginosa are examples); or (2) are a multidrug-resistant member of the Enterobacteriaceae family, although at this time remain susceptible to carbapenem antibiotics (e.g., ESBL-producing K. pneumoniae)]. GI endoscopes, particularly ERCP endoscopes, pose a risk of transmission of CRE and their related superbugs, both in the United States and globally. Indeed, patient morbidity and mortality due to GI endoscopes contaminated with these antibiotic-resistant bacteria have been documented[13,20-22,24,26-33]. Reports of GI endoscopes transmitting other types of bacteria, too, as well as viruses and other infectious agents, also have been published during the past 30 years. No matter, if performed in strict compliance with the endoscope’s labeling, supplemented as needed with professional organizations’ published guidelines, however, current practices for reprocessing GI endoscopes, which include high-level disinfection (performed either manually or using an AER), appear sufficient to prevent transmissions of CRE and their related superbugs (provided the high-level disinfectant contacts all of the instrument’s contaminated surfaces). This assessment is consistent with the current positions of the Society for Gastroenterology Nurses and Associates (SGNA), the American Society of Gastrointestinal Endoscopy (ASGE), and the CDC, the latter of which reports that, while it may be considered, EtO sterilization of the GI endoscope does not appear necessary to prevent CRE transmissions (the CDC’s findings published in MMWR notwithstanding). A number of questions that this article raises about CRE, their resistance to antibiotics, and the risk of their transmission during GI endoscopy are listed in Table 1. Several reasons why the recent emergence of CRE, both in the United States and globally, is a serious public-health concern are listed in Table 2. And, Table 3 provides a number of recommended practices - for example, to clean GI endoscopes thoroughly - intended to prevent the transmission of CRE via a contaminated GI endoscope. For simplicity, this article’s discussion is divided into two sections: the first focuses on the epidemiology and traits of CRE and their related superbugs, and the second on several outbreaks linked to GI endoscopes contaminated not only with CRE, like Hospital X’s outbreak in 2013, but also with other types of infectious agents, including viruses, prior to CRE’s emergence around the turn of this century. Table 1 Several questions that this article answers. (1) What is a “superbug”? (2) What are carbapenem-resistant Enterobacteriaceae, or “CRE,” and their related superbugs? (3) What are carbapenem-producing Enterobacteriaceae, or “CPE”? (4) What important mechanism can cause CRE to become resistant to carbapenem antibiotics? (5) What is a “carbapenemase” enzyme? (6) What is a “β-lactam antibiotic” and a “β-lactam ring”? (7) What are ESBL-producing Enterobacteriaceae and how do they differ from CRE? (8) What types of infections do CRE cause? (9) By what three mechanisms may Enterobacteriaceae acquire the genetic coding necessary to produce carbapenemases and become carbapenem-resistant? (10) Prior to the emergence of CRE, what types of infectious agents have been historically transmitted during GI endoscopy? (11) Is GI endoscopy a risk factor for CRE transmissions? (12) What are some of the details and possible causes of the well-publicized CRE outbreak following ERCP performed by “Hospital X” in the mid-west (United States) that has recently raised public concerns about the risk of transmission of CRE during GI endoscopy? (13) What are some of the details of other CRE outbreaks that similarly have been linked to GI endoscopy since this superbug’s emergence and have been published either in the medical literature or the FDA’s MAUDE database? (14) Is high-level disinfection (whether automated or performed manually) of GI endoscopes sufficiently robust to prevent CRE transmissions? Or, is EtO sterilization of GI endoscopes required to prevent CRE transmissions? (15) What do professional organizations including the CDC, FDA, SGNA, and ASGE currently recommend for reprocessing GI endoscopes potentially contaminated with CRE? (16) What are some important recommendations that healthcare professionals may follow to minimize the risk of CRE transmission during GI endoscopy? CRE: Carbapenem-resistant Enterobacteriaceae; GI: Gastrointestinal; EtO: Ethylene oxide gas; ASGE: American Society of Gastrointestinal Endoscopy. Table 2 Reasons why the recent emergence of carbapenem-resistant Enterobacteriaceae and their related superbugs is a serious public-health concern. CRE: Carbapenem-resistant Enterobacteriaceae; HAIs: Healthcare-associated infections. Table 3 Recommended practices for the effective reprocessing of gastrointestinal endoscopes. CRE: Carbapenem-resistant Enterobacteriaceae; GI: Gastrointestinal. More than any other recent report of disease transmission during GI endoscopy, Hospital X’s outbreak of NDM-1-producing E. coli in 2013, which resulted in the infection or colonization of 38 patients who underwent ERCP, has placed the risk of CRE transmission during GI endoscopy under a powerful microscope, if not also on a front burner. Causing a new sense of urgency, the CDC’s published report of this hospital’s outbreak of CRE, coupled with the contemporaneous findings of a hospital inspection report by the CMS associating this outbreak with three contaminated ERCP endoscopes (of the same model type), have heightened understandable speculation and concern about the safety and quality of GI endoscopy. Moreover, the reporting by CMS that two of Hospital X’s 10 CRE-infected patients died may have irrevocably changed the landscape of infection control and endoscope reprocessing. As a direct consequence of, first, the CDC having attributed a likely cause of Hospital X’s CRE outbreak (at least in part) to the physical design of the ERCP endoscope (Figure 1A and B); and, second, the CDC’s observation that Hospital X’s replacement of automated high-level disinfection for reprocessing its ERCP endoscopes with EtO sterilization reportedly stopped this CRE outbreak, it is reasonable to presume, too, that the FDA’s regulatory oversight of manufacturers of GI endoscopes and related instrumentation, including AERs, may increase. It may be that Hospital X’s CRE outbreak will also cause healthcare accrediting organizations and state health departments to more closely scrutinize the infection-control and endoscope-reprocessing practices of surveyed GI endoscopy departments. “Superbugs” and “nightmare bacteria” are two monikers often used to describe certain epidemiologically important, multidrug-resistant bacteria, including CRE and other related gram-negative bacteria, that pose at least three threats to public health[17,34]. First, these bacteria are resistant to multiple classes of antimicrobial drugs. In fact, some strains of CRE are pan-resistant (i.e., resistant to all antibiotics). Second, these resistant bacteria can share mobile pieces of genetic material, conferring their antibiotic resistance to other once-susceptible bacteria that are physically nearby and of either the same or a different species or family of bacteria. And, third, the mortality rates of patients infected with these superbugs are relatively high (compared to their antibiotic-susceptible bacterial counterparts). For example, CRE infections of the bloodstream are reportedly associated with a mortality rate of as high as 40%-50%[16,33-35],which is significantly higher than that of patients with antibiotic-susceptible bacterial bloodstream infections. According to the CDC, more than 2 million people are infected with a superbug each year in the United States, and at least 23000 die as a consequence, with the overuse of antibiotics being cited by the CDC as the primary cause of the emergence of CRE and other superbugs. [Note: Although not a focus of this article, other well-known organisms also commonly referred to as “superbugs” include vancomycin-resistant enterococci (VRE) and methicillin-resistant staphylococcus aureus (MRSA), both of which are gram-positive bacteria]. As their name betrays, CRE are resistant to carbapenems, which are a class of antimicrobial drugs known as broad-spectrum β-lactam antibiotics. This is a concerning trait, because these “big gun” antibiotics have been used by clinicians as a “last line” of defense, or “last resort,” for treating many types of serious infections caused by multidrug-resistant gram-negative bacteria[17,34]. CRE’s resistance to carbapenem antibiotics - specific examples of carbapenems include doripenem, ertapenem and imipenem - significantly limits the number of available treatment options. And the very few antibiotics that remain effective for treating CRE-infected patients are generally undesirable because of their adverse side-effects, which can include nephrotoxic reactions. These and other reasons discussing why the recent emergence of CRE and their related superbugs is a growing public health concern are summarized in Table 2. CRE are members of the large Enterobacteriaceae family, which both includes more than 70 genera and is the largest collection of medically important gram-negative bacilli. Many of the species of bacteria in this family (whether or not multidrug-resistant) are “enteric” (i.e., they commonly reside in the normal, healthy intestinal flora of humans and other types of animals) and “opportunistic” (i.e., they ordinarily cause disease only in patients with weakened or compromised immune systems). Examples of some of this family’s genera include: Klebsiella, Salmonella, Enterobacter, and Serratia. Being non-spore forming (vegetative) bacteria, Enterobacteriaceae are readily destroyed by not only high-level disinfection (and sterilization and other harsh environmental conditions), but also by intermediate-level disinfection, and usually even by low-level disinfection. The increasing resistance of once-susceptible strains of Enterobacteriaceae to carbapenems is relatively recent, with the first documented case of CRE infection occurring in a patient in North Carolina (United States), in 2001. Emergent species of CRE include: K. pneumoniae, which is the most commonly encountered species of CRE in the United States; E. coli; and Enterobacter cloacae. Because CRE can be spread through direct or indirect contact with feces (and other infectious materials), not only (among other practices) is proper hand hygiene necessary to interrupt their transmission in the healthcare setting, but also, as this article found, GI endoscopy is a confirmed risk factor for infections and colonizations of CRE and their related superbugs[25,31]. While still relatively low, the incidence of healthcare-associated infections (HAIs) caused by CRE and their related superbugs in acute-care hospitals, both in the United States and globally, has increased significantly during the past decade, posing a growing and serious public health threat (Table 2)[16,19,25,32]. According to the CDC, data from one national surveillance system suggest that the proportion of Enterobacteriaceae in the United States that have acquired a resistance to carbapenems (i.e., CRE) has increased more than 3-fold, from 1.2% in 2001 to 4.2% in 2011. Without effective antimicrobial drugs to treat them, infections of CRE following a medical procedure could prove to be even more insidious to public health than those caused by HIV 30 years ago, and since. Indeed, in contrast to infections caused by CRE, HIV infection: (1) can be controlled with (anti-viral) drugs (whereas some CRE strains are pan-resistant); (2) is not associated with a mortality rate of as high as 50% (like that of CRE infections of the bloodstream); and (3) requires only Standard Precautions to prevent its spread (whereas Contact Precautions may be additionally required to prevent the spread of CRE in the healthcare setting). Further, HIV is not ordinarily transmitted from one patient to another due to poor hand hygiene, but rather is generally spread only through exposure to infected blood or other infectious fluids and materials (whereas CRE infections can be a consequence of poor hand hygiene). And, although outbreaks of CRE linked to contaminated GI endoscopes, with associated morbidity and mortality, have been reported and no longer are rare adverse events[13,20-22,33,36-39], HIV transmission during GI endoscopy has not been documented. As discussed, carbapenems are not an effective treatment for patients infected with CRE. An understanding of one important mechanism that renders CRE and their related superbugs resistant to carbapenems requires some knowledge about the molecular structure of these antimicrobial drugs. Carbapenems are a type of β-lactam antibiotic, and - like that of all β-lactam antibiotics, including cephalosporins, monobactams, and penicillins, the latter of which are the archetype of β-lactam antibiotics - the core molecular structure of carbapenems features a β-lactam ring. The four-membered chemical structure of this ring is displayed in Figure 2. 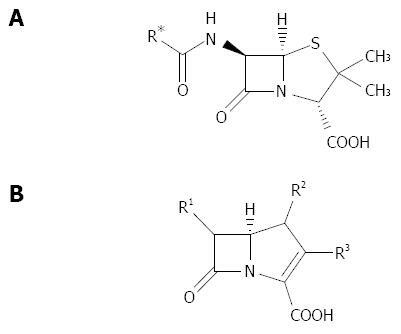 The respective molecular structure of a penicillin and of a carbapenem, each necessarily featuring the characteristic β-lactam ring (Figure 2), is displayed in Figure 3A and B, respectively. Figure 2 Displayed is the β-lactam ring’s four-membered (i. e., a square) chemical structure. Figure 3 Displayed are the core chemical structures of two different types of β-lactam antibiotics: A penicillin and a carbapenem. Both antibiotics feature the four-membered β-lactam ring. A: The core chemical structure of penicillin antibiotics; B: The core chemical structure of carbapenem antibiotics. (*The “R” in either diagram denotes a distinct side chain that is attached to the molecule’s core). The resistance of Enterobacteriaceae to carbapenem antibiotics may be mediated by a number of different mechanisms, although only one is the focus of this review: through their synthesis (or production) of carbapenemases, which are a type of enzyme, known as a β-lactamase enzyme, that hydrolyzes (i.e., chemically breaks down) the β-lactam ring (Figure 2) of carbapenems (and other β-lactam antibiotics) (Figure 3). (Other mechanisms that confer a bacterium’s resistance to an antibiotic include the active removal of the antibiotic from inside the bacterium’s cell, or through the chemical modification of the bacterium’s target site so that the antibiotic no longer recognizes it). Through this one particular mechanism, Enterobacteriaceae that are inherently with, or that have acquired, the genetic material (i.e., DNA) necessary to produce carbapenemases can (but do not always) display a resistance to carbapenems, generally precluding the use of these antibiotics to treat infected patients. These resistant bacteria are a specific type of CRE known as carbapenemase-producing Enterobacteriaceae, or “CPE”, which are responsible for most CRE-related outbreaks encountered in the clinical setting, including Hospital X’s aforementioned CRE outbreak. (While CPE are a type of CRE, not all CRE are CPE; mechanisms other than the resistant bacteria’s production of carbapenemases can cause CRE to be resistant to carbapenems). Until recently, bacteria in the Enterobacteriaceae family rarely carried the genetic material necessary to synthesize carbapenemase enzymes. As a result, carbapenems were usually an effective treatment for patients infected with these (carbapenem-susceptible) bacteria, including challenging Enterobacteriaceae that produce another type of enzyme called extended-spectrum β-lactamases, or “ESBLs”. Indeed, carbapenem antibiotics remain indicated for the treatment of serious infections caused by ESBL-producing Enterobacteriaceae (but not those caused by CRE). Reportedly in response to the overuse of antibiotics, however, while some strains of Enterobacteriaceae remain susceptible to carbapenems, others have acquired the genetic material necessary to produce carbapenemases through the process of natural selection, heralding CPE’s recent emergence. [Note: In this context “natural selection” is defined as a process by which surviving and multiplying bacteria have adapted to their environment. In contrast, those bacteria that do not adapt to their changing environmental conditions generally become extinct. Further, antibiotics can present a “selective pressure” that destroys susceptible, unadapting bacteria, but that, for those bacteria that undergo natural selection and become resistant to the antibiotics, have little or no effect]. Carbapenems were ironically developed a generation ago to treat patients infected with those strains of Enterobacteriaceae that had begun to display a resistance to cephalosporins, which previously had been an effective antibiotic treatment for patients infected with these bacteria. This displayed resistance to cephalosporins was predominantly due to these bacteria’s production of ESBLs. Like carbapenemases, ESBLs chemically hydrolyze (i.e., break down and inactivate) the β-lactam ring of cephalosporins, rendering these β-lactam antibiotics ineffective. ESBL enzymes are distinct from carbapenemase enzymes, however, and while ESBL-producing Enterobacteriaceae, which are a type of superbug similar to but not CPE, are resistant not only to cephalosporins but also to most other types of β-lactam antibiotics, including penicillins, they (unlike CRE) currently remain susceptible to carbapenems. CPE produce several different types of carbapenemase enzymes, three of which this article discusses. KPC-producing Enterobacteriaceae: The most commonly identified carbapenemase in the United States produced by certain CRE (namely, CPE) is K. pneumoniae carbapenemase, or “KPC”. Isolated for the first time in North Carolina (United States), in 2001, from a patient infected with a carbapenem-resistant strain of K. pneumoniae, KPC has since spread around the world. Logically, strains of K. pneumoniae that produce KPC are called KPC-producing K. pneumoniae, and, although it reportedly did not infect or colonize any of Hospital X’s 38 affected patients, the CDC recovered this specific type of CRE from the implicated ERCP endoscope during its investigation of Hospital X’s CRE outbreak in 2013. Encoded by a highly transmissible gene known as the “blaKPC” gene, the KPC enzyme is no longer exclusively produced by K. pneumoniae, however. [Note: “bla” refers to the gene that is responsible for the bacterium’s production of the said β-lactamase enzyme and, therefore, for the bacterium’s antibiotic resistance. For example, “blaKPC” refers to the gene (often, but not always, of K. pneumoniae) that is responsible for the production of the subscript-noted enzyme - in this example, of the KPC enzyme]. Due to the concerning ability of CRE (and other superbugs) to share genetic material that confers antibiotic resistance, KPC (although first identified in and still predominantly produced by K. pneumoniae) has also been recently identified in other genera and families of gram-negative bacteria that have acquired the blaKPC gene - for example, in E. coil, Pseudomonas aeruginosa, and Acinetobacter spp. (i.e., KPC-producing E. coli, KPC-producing P. aeruginosa, and KPC-producing Acinetobacter spp., respectively, the latter two of which are not Enterobacteriaceae). [Note: P. aeruginosa, like Klebsiella spp. and E. coli, is a gram-negative (non-spore-forming vegetative) bacterium. But, unlike these other two, which are members of the Enterobacteriacae family, P. aeruginosa is of the Pseudomonadaceae family and therefore, while some of its strains may be classified as bona fide“superbugs,” it is not CRE. Similarly, Acinetobacter spp. are of the Moraxellaceae family, and those bacteria within this family that have acquired the blaKPC gene and are resistant to carbapenems are not CRE, although, too, may be classified as superbugs]. NDM-producing Enterobacteriaceae: Described first in 2009 in a European patient infected with an antibiotic-resistant bacterium while traveling to India, the NDM-1 (New Delhi metallo-β-lactamase-1) enzyme is a second example of a carbapenemase. [Note: The number “1” associated with the initials “NDM” denotes specificity to the NDM enzyme. NDM-2 and NDM-3, for example, are variants of NDM-1 and therefore are similar, but different, enzymes, featuring unique amino acid substitutions compared to the NDM-1 enzyme and to one another]. This infected patient was unsuccessfully treated while in a New Delhi hospital, and, after the patient’s repatriation to Europe, a carbapenem-resistant strain of K. pneumoniae bearing (not the blaKPC gene, but the) the blaNDM-1 gene was identified as the infection’s cause. (In this section’s example, blaNDM-1 refers to the gene of the K. pneumoniae bacterium that is responsible for its production of the NDM-1 enzyme). NDM-1 is referred to as a metallo-β-lactamase (MBL) enzyme because it uses a metal ion (i.e., zinc) to catalyze the hydrolysis of (that is, to chemically inactivate) carbapenems and other β-lactam antibiotics. In addition to identifying the newly described resistance mechanism of NDM-1 for the first time in the United States, a report in 2010 described, also for the first time in the United States, MLB-producing Enterobacteriaceae. And, NDM-1 was isolated for the first time from a (carbapenem-resistant) strain of P. aeruginosa (which is of the Pseudomonadaceae family and therefore, while a superbug, it is not CRE) in Serbia, in 2011, and in the United States (Delaware), in 2014. The most common CRE that produce the NDM-1 enzyme include NDM-1-producing K. pneumoniae, the resistance of which is conferred by the blaNDM-1 gene; and NDM-1-producing Enterobacter cloacae (the resistance of which is also conferred by the blaNDM-1 gene). As previously discussed, NDM-1-producing E. coli was the specific bacterial strain that the CDC determined in 2013 was responsible for the outbreak of CRE at Hospital X following ERCP[25,28]. While not of the Enterobacteriaceae family and therefore not CRE, carbapenem-resistant strains of Acinetobacter spp. (i.e., Acinetobacter baumannii), in addition to producing KPC (via the acquired blaKPC gene), have also been found in the clinical setting to produce NDM-1 (via the acquired blaNDM-1 gene) and NDM-2 (via the acquired blaNDM-2 gene). VIM-producing Enterobacteriaceae: First identified in Italy, Verona integron-encoded metallo-β-lactamase, or “VIM,” is a third example of a carbapenemase enzyme produced by certain carbapenem-resistant bacteria (i.e., CPE). This enzyme was initially isolated from P. aeruginosa (which, again, is not a CRE), with a variant of this enzyme (i.e., VIM-1) being isolated from Enterobacteriaceae, namely from VIM-producing K. pneumoniae (or VPKP), in the United States in 2010. Similar to the KPC enzyme’s production being encoding by the transmissible “blaKPC” gene, production of the VIM enzyme is encoded by the blaVIM gene. The production of KPC and VIM by strains of CRE confers their resistance (through hydrolysis) to carbapenems. In general, bacteria may acquire the genes necessary to become resistant to an antibiotic drug by one of a number of different mechanisms - for instance, through a naturally inherited genetic trait. Virtually all bacteria in the Enterobacteriaceae family naturally produce certain β-lactamase enzymes that confer their intrinsic resistance to penicillins (but not carbapenems). Another example is through a spontaneous mutation of their existing genetic material, with the newly acquired resistance-conferring trait being passed on to subsequent generations (e.g., natural selection). (The overuse of antibiotics is a type of “selective pressure” that reportedly has caused bacteria, through natural selection, to acquire the necessary genetic material to synthesize enzymes, such as carbapenemases and ESBLs, that inactivate and render ineffective one or more types of antibiotics, such as carbapenems and cephalosporins, respectively). And a third mechanism by which bacteria may acquire the genes necessary to become resistant to an antibiotic drug is through the acquisition of new genetic material from other, already-resistant bacteria of either the same or of a different bacterial species (or family), with this newly acquired resistance-conferring genetic material being passed on to subsequent generations. An example of this type of “gene sharing” is the horizontal transfer of the blaKPC gene from carbapenemase-producing K. pneumoniae to carbapenem-susceptible E. coli, resulting in the latter becoming KPC-producing E. coli. Independent factors that increase a patient’s risk of becoming infected with CRE include: (1) prior treatment with carbapenems or another antibiotic (e.g., fluoroquinolones and broad-spectrum cephalosporins); (2) receiving treatment in an intensive care unit (ICU); (3) having received mechanical ventilation; (4) being elderly; (5) being immuno-suppressed (e.g., patients receiving an organ or stem cell transplant); (6) the placement of a central venous catheter; and (7) having diabetes. Undergoing GI endoscopy, especially ERCP, now also has been identified as a risk factor for CRE infection[25-31,33]. To be sure, Hospital X’s outbreak in 2013 is the most publicized instance in the United States directly linking GI endoscopes contaminated with CRE to patient morbidity and/or mortality. To date, only patients receiving medical treatment in hospitals (i.e., HAIs), long-term acute care facilities, and nursing homes are reportedly prone to CRE infection. According to the CDC, however, Enterobacteriaceae that are resistant to carbapenems (i.e., CRE) will soon also be responsible for infections in community settings. In addition to biliary tract infections and other type of infections associated with contaminated GI endoscopes, CRE can cause urinary tract infections (or UTIs, which are the most common types of CRE infections); wound infections; bloodstream infections (which, as previously noted, are associated with a 40%-50% mortality rate); and ventilator-associated pneumonia. While very few antibiotics are effective for treating patients infected with CRE, drug treatment may include the administration of polymyxins. These are an older type of antibiotic drug that includes colistin, and, while effective against most gram-negative bacilli and some strains of CRE, polymyxins can have toxic side-effects. Tigecycline may also be used to treat certain CRE infections, but this antibiotic drug achieves poor serum levels, limiting its clinical effectiveness and, therefore, its use. Although the risk of disease transmission during GI endoscopy is reported to be low, infections and outbreaks due to contaminated GI endoscopes, with associated patient morbidity and mortality, have been documented a number of times during the past 30 years, both prior to and since CRE’s emergence[2,4-12,14,33,34]. These cases include infections of bacteria, including P. aeruginosa, and viruses, namely, the hepatitis B (HBV) or C virus (HCV). Like their emergence in the United States and globally, only during the past few years has the transmission of CRE been linked to GI endoscopy[13,20-22,25,33,36-39]. While for historical purposes, contextual insight, and important perspective a number of cases of disease transmission during GI endoscopy prior to CRE’s emergence are discussed below, this section’s primary focus in placed on outbreaks of CRE and their related superbugs due to a contaminated GI endoscope. Prior to the turn of this century and CRE’s emergence, infections and outbreaks due to contaminated GI endoscopes (while infrequent) had been reported, most often being attributed to the transmission of P. aeruginosa during ERCP, and less commonly to the transmission of other types of bacteria including Enterobacteriaceae (e.g., Salmonella spp., Klebsiella spp. and Serratia spp.) during either esophagogastroduodenoscopy (or, “EGD”) or colonoscopy. (Prior to 2001 the resistance of these transmitted strains of Enterobacteriaceae to carbapenems in the United States and globally was rare). The specific breach typically responsible for these instances of disease transmission was reported to be, as much if not more so than faulty cleaning and inadequate high-level disinfection, insufficient drying of one or more of the GI endoscope’s several internal channels, particularly the exposed elevator wire channel of some models of ERCP endoscopes, using either manual reprocessing procedures or an AER[7-9,11,12,14]. In only a very few cases has the transmission of a bloodborne virus (i.e., HBV or HCV) been reported during GI endoscopy, with the un-sterile administration of an iv medication typically being identified as, or suspected of being, the outbreak’s proximate cause or a likely contributing factor[9,10]. And, no cases of the transmission of HIV due to a contaminated GI endoscope have been reported, either prior to or since CRE’s emergence. Providing some crucial insight and conclusions about the corrective actions necessary to prevent the transmission of superbugs during GI endoscopy in later years, the circumstances of several outbreaks reported prior to CRE’s emergence are discussed below. Whether the actual risk of infection via a contaminated GI endoscope is significantly higher than reported (e.g., 1 in 1.8 million), due to under-reporting, the lacking surveillance of post-endoscopic infections, and “missed” infections, has been suggested[33,43]. With historical and clinical significance, several reported instances of disease transmissions during GI endoscopy occurred prior to the emergence of CRE. For example, Birnie et al (1983) report a case of patient-to-patient transmission of HBV during GI endoscopy. These authors conclude that the failure to clean, high-level disinfect, and dry the air/water channels of a gastroscope was likely the cause of HBV transmission. While recommending that these channels be thoroughly high-level disinfected to prevent infection, Birnie et al (1983) also suggest consideration of EtO gas (in lieu of high-level disinfection) to sterilize GI endoscopes potentially contaminated with HBV. (The replacement of high-level disinfection with EtO sterilization was the same measure that Hospital X implemented in 2013 to stop its CRE outbreak[25-31]). Similarly, Bronowicki et al (1997) report transmission of the HCV from one patient to two others during colonoscopy. These authors conclude that inadequate cleaning of the colonoscope’s working (or instrument) channel; inadequate disinfection of the colonoscope (a 5-min immersion in 2% glutaraldehyde instead of a 20-min immersion as guidelines recommend); and the failure to sterilize the reusable biopsy forceps were likely responsible for this outbreak. This report notes, however, the possibility that the improper, un-sterile administration of iv medications was the cause of HBV transmission. Cryan et al (1984) report an outbreak of P. aeruginosa following ERCP, with associated patient morbidity and mortality. This report concludes that this outbreak was related to inadequate high-level disinfection of the ERCP endoscope’s air/water channels. Following the introduction of a modified reprocessing technique, which involved rinsing the ERCP endoscope’s air/water channels with a disinfectant, no further P. aeruginosa infections were identified. Allen et al (1987) also report an outbreak of P. aeruginosa following ERCP. These authors conclude that this outbreak was due, in part, to the failure by an AER to dry every one of an ERCP endoscope’s internal channels, including its exposed elevator wire channel. According to this report, another contributing factor to disease transmission was likely the contamination of the internal structures and components of the AER used to reprocess the ERCP endoscopes. The outbreak ended only once 70% alcohol was manually suctioned through the ERCP endoscope’s channels followed by their being dried. Similarly, Alvarado et al (1991) document an outbreak of P. aeruginosa following upper GI endoscopy, including ERCP, due to the faulty design of an AER, which resulted in the contamination of the water used by the AER to rinse the GI endoscopes after high-level disinfection. According to these authors, this outbreak, like the outbreak reported by Allen et al (1987), was terminated only once the GI endoscopes, disinfected using the faulty AER, were terminally rinsed with 70% alcohol followed by forced air drying. And, Streulens et al (1993) report an outbreak of P. aeruginosa and of three strains of Enterobacteriaceae (namely, K. pneumoniae, Enterobacter cloacae, and S. marcescens) following ERCP. These different bacteria were isolated from the GI endoscope and/or the AER used for reprocessing. Improper reprocessing and drying of the ERCP endoscopes were reportedly at fault. These authors report that the outbreak was terminated once: the ERCP endoscope’s (exposed) elevator-wire channel was properly high-level disinfected; all of the ERCP endoscope’s channels were flushed with 70% alcohol and air dried; and the AER’s internal components were themselves disinfected. In summary, infections and outbreaks due to contaminated GI endoscopes prior to CRE’s emergence were typically caused by P. aeruginosa (likely of an exogenous origin) infecting patients during ERCP. Less frequently reported were patient-to-patient transmissions of HBV and HCV. Whereas improper reprocessing, in general, and inadequate drying of the ERCP endoscope’s exposed elevator wire channel, in particular (whether performed manually or using an AER), were often reported to be responsible for bacterial infections following GI endoscopy, viral transmissions, in contrast, were (and are today) often reported to be due to either the improper cleaning of the GI endoscope (or endoscopic accessory) or, possibly more often, to the un-sterile administration of an iv medication during GI endoscopy. Like the aforementioned report published in MMWR discussing the CDC’s investigation of Hospital X’s CRE outbreak in 2013[25-31], a number of other reports published in the medical literature since CRE’s emergence similarly document infections and colonizations of CRE and their related superbugs due to a contaminated GI endoscope, most often (as prior to CRE’s emergence, too) to an ERCP endoscope[13,20-22,24,33,36-39]. [Note: The ERCP endoscope’s unique and complex physical design - coupled with the increased invasiveness of, and complication rate associated with, ERCP especially in the presence of biliary tract obstruction and tissue injury - may explain why bacterial infections including those caused by CRE are more often associated with ERCP than with any other type of GI endoscopic procedure (Figure 1)[7,11,20-22,25]]. Providing crucial insight into both the causes and prevention of CRE transmissions during GI endoscopy, several of these recently published reports conclude that the ERCP endoscope’s physical design likely contributed to the transmission of CRE or a related superbug[13,20-22,24-30]. For example, Carbonne et al (2010) discuss a multi-hospital outbreak of CRE identified in a suburb south of Paris, France, in 2009, with 8 documented cases of infection or colonization due to KPC-producing K. pneumoniae following ERCP. According to this report, this outbreak highlights the risk of transmissions of CRE and related multidrug-resistant bacteria during GI endoscopy, particularly during ERCP. Carbonne et al (2010) conclude that a single ERCP endoscope was a “persistent source” of contamination and the mode of transmission of the outbreak’s CRE strain. Publishing findings similar to these authors, Alrabaa et al (2013) reported that, between June, 2008, and January, 2009, 7 patients in Florida (United States) were infected or colonized with KPC-producing K. pneumoniae following ERCP performed at one endoscopy center (shared by two hospitals). Infection sites included blood, bile, and urine, and one of the infected patients died during hospitalization. Whether this report documents the first instance of CRE transmission in the United States via a contaminated GI endoscope is unclear. Consistent with both the CDC’s report discussing Hospital X’s CRE outbreak and Carbonne et al’s (2010) report, both of which implicate the ERCP endoscope’s complex physical design as likely responsible for disease transmission, Alrabaa et al (2013) found the suspect GI endoscope’s “elevator area” to be contaminated with carbapenemase-producing E. coli (not the outbreak’s strain of KPC-producing K. pneumoniae), due to “inadequate cleaning of the complex terminal part of the ERCP scope.” Acknowledging that the ERCP endoscope is particularly difficult to clean because its distal tip features a “small tube with a complex design including a small mobile metal piece called the ‘elevator’,” Alrabaa et al (2013) conclude that the contaminated GI endoscope itself was the source of this outbreak’s CRE strain. 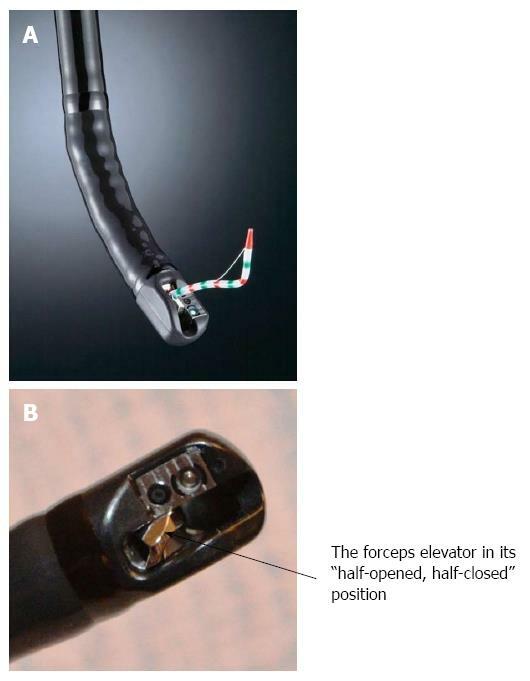 According to this report, the ERCP endoscope’s “elevator piece” was not cleaned in accordance with the manufacturers’ instructions and “needs additional manual cleaning using a brush prior to standard scope processing,” to prevent disease transmission and ensure that this elevator piece does not harbor “dangerous microorganisms” or “biodebris” that Alrabaa et al (2013) found remained under the elevator piece of the implicated scope after it was presumably cleaned. Discussing another outbreak in Clermont-Ferrand, France, Aumeran et al (2010) report that 16 patients were infected or colonized with an ESBL-producing K. pneumoniae following ERCP performed between December, 2008 and August, 2009. (As previously discussed, whereas CRE are resistant to both types of antibiotics, ESBL-producing Enterobacteriaceaea, a related superbug, are resistant to cephalosporins, but not carbapenems). Like the conclusions of the CDC’s report in MMWR and of the findings of both Carbonne et al (2010) and Alrabaa et al (2013), Aumeran et al (2010) further report that the outbreak’s strain “was finally isolated from one duodenoscope (i.e., an ERCP endoscope).” Specifically, these authors report that: (1) ERCP endoscopes “can act as a reservoir” for ESBL-producing K. pneumoniae and other types of multi-drug resistant bacteria; (2) contamination of the ERCP endoscopes persisted “despite repeated disinfections”; (3) these ERCP endoscopes are “difficult to clean and disinfect” and are of a design that precludes detachment of their distal tip, making “mechanical removal of the distal debris in the elevator wire channel more difficult”; and (4) “appropriate mechanical flushing and cleaning with detergent of the raiser channel that contains the elevator wire is an essential step for these devices”. Similarly, Bajolet et al (2013) reported an outbreak at a hospital in Reimes, France, in 2011, linked to a single gastroscope contaminated with ESBL-producing P. aeruginosa, which is yet a third type of gram-negative, multidrug-resistant superbug related to (but not) CRE. In addition to having identified some important breaches in the manual cleaning of the gastroscope, Bajolet et al (2013) report that a minor defect, namely, wear of adhesive at the gastroscope’s distal sheath, “may have contributed to the development and persistence of bacterial biofilm in this case”. This report highlights the importance of, not only the potential contribution of the GI endoscope’s physical design to HAIs, but also the proper servicing, maintenance, and visual inspections of GI endoscopes to the prevention of patient-to-patient transmission of CRE. And, Naas et al (2010) reported an outbreak in France caused by a single contaminated side-viewing duodenoscope’s transmission of KPC-producing K. pneumoniae. To prevent infection, these authors recommend: (1) prompt reprocessing of the GI endoscope after its use - not as many as 24 h later during which time patient debris may dry and harden on the endoscope, becoming more difficult or remove during cleaning; (2) assuring thorough drying of the GI endoscope’s internal channels; and (3) microbiologically sampling the GI endoscope several times a year, to evaluate its channels and other surfaces for bacterial contamination. Like those published in the peer-reviewed medical literature, a number of reports recently filed in the FDA’s MAUDE database by hospitals and manufacturers of GI endoscopes and related medical equipment (but without identifying the medical facility by its name), as a regulatory requirement, provide crucial information into the causes of, risk factors for, and prevention of CRE transmissions during GI endoscopy[36-39] [Note: The MAUDE database features medical device reports mandatorily submitted to the FDA by certain entities (e.g., manufacturers) and voluntarily reported by health care professionals, patients and consumers]. These reports almost exclusively cite a contaminated ERCP endoscope as the likely cause of a confirmed infection or outbreak of CRE or their related superbugs following GI endoscopy. Several of these reports filed in 2012, 2013 and 2014 are listed in Table 4, including the report in the MAUDE database documenting Hospital X’s outbreak. (Outbreaks of CRE linked to contaminated GI endoscopes in the United States and identified in the MAUDE database were most common in 2014, one reason for which may be that CRE and its related superbugs have only recently emerged). But, as with infections of carbapenem-susceptible bacteria linked to GI endoscopy, whether the actual incidence of CRE transmissions due to a contaminated GI endoscope is significantly higher than reported in the medical literature and the FDA’s MAUDE database, due to, for example, under-reporting, is unclear, although possible. Table 4 Several reports of outbreaks of carbapenem-resistant Enterobacteriaceae (or a related superbug) following gastrointestinal endoscopy that were filed in the Food and Drug Administration’s MAUDE database between 2012 and 2014 by manufacturers of gastrointestinal endoscopes and related medical equipment. These reports, which do not identify the medical facility by name, associate a contaminated ERCP endoscope with a confirmed patient infection or colonization, or with an outbreak of CRE or a related superbug. (Some of these reports are included in this article’s reference section. This table's listed reports for each year may not be inclusive of every report filed in that year). CRE: Carbapenem-resistant Enterobacteriaceae; GI: Gastrointestinal. In summary, several reports of infections and colonizations in the United States and Europe (often France, the reasons for which are unclear) due to a GI endoscope, most often to an ERCP endoscope, contaminated with CRE or a related superbug have been published during the past few years, both in the peer-reviewed medical literature and the FDA’s MAUDE database (Table 4). These reports frequently cite the physical design of the GI endoscope as a factor contributing to disease transmission, often adding that the ERCP endoscope’s “forceps elevator” or “elevator area” is difficult to clean and typically the surface of the endoscope contaminated with the outbreak’s superbug strain (Figure 1B), despite these investigations typically reporting that this surface was reprocessed[20-22,25]. In one instance (i.e., Hospital X’s CRE outbreak), the replacement of automated high-level disinfection of the GI endoscope with EtO sterilization terminated the CRE outbreak[25,31]. For each of these reports, whether the outbreak’s strain of CRE or their related superbugs originated in the environment (e.g., contaminated water) or was patient-borne is typically not determined or clarified. A demonstrated public health threat both in the United States and globally, transmissions of CRE are not exclusive to GI endoscopy. Other types of flexible endoscopic procedures, including bronchoscopy and cystoscopy (as well as other types of medical procedures unrelated to flexible endoscopy), are also identified risk factors for infections (and predictors for colonizations) with CRE and related superbugs[23,44,45]. Indeed, some infection-control measures designed to prevent CRE transmission during GI endoscopy may also be employed during these other flexible endoscopic procedures for the successful prevention of infection. For example, Koo et al (2012) discuss an outbreak of NDM-1 K. pneumoniae linked to contamination of the video camera head of urological instrumentation. Chang et al (2013) similarly report a CRE outbreak at a regional teaching hospital in southern Taiwan, finding an ureteroscope contaminated with ertapenem-resistant E. cloacae (a type of CRE) to be responsible for several UTIs. Chang et al’s (2013) findings are not entirely surprising, since UTIs are the most common types of HAIs caused by CRE. Like Hospital X’s CRE outbreak, this outbreak in Taiwan was reportedly terminated only once the hospital used EtO sterilization to process the implicated ureteroscope[9,25,44]. Sorin et al (2001) report that 18 patients were either colonized or infected with imipenem-resistant P. aeruginosa (IRPA), an infectious strain of bacteria that, while of the Pseudomonadaceae, not Enterobacteriaceae, family and therefore not CRE, is a related superbug that is resistant to carbapenems. (Noted previously, imipenem is a type of carbapenem antibiotic). This outbreak was reportedly due to the improper connection of an automated reprocessing device to the bronchoscope’s suction channel, presumably precluding the endoscope’s effective reprocessing. Sorin et al’s (2001) findings suggest that contaminated bronchoscopes, too, like GI endoscopes and urological equipment, pose a risk of transmission of multidrug-resistant gram-negative bacteria, like IRPA and CRE. Whether other types of GI endoscopes featuring an exposed elevator wire channel, such as those used during endoscopic ultrasonography (or, “EUS”), might also be difficult to clean and pose an increased risk of CRE transmission is unclear, but possible. Based in part on a review of Sorin et al’s (2001) report, Muscarella (2004) found that environmental surfaces including tap water may, too, be reservoirs for antibiotic-resistant strains of gram-negative bacteria. High-level disinfection: Does it rapidly destroy CRE and related superbugs? An important question to address - in response to the CDC’s report in MMWR that Hospital X’s outbreak of CRE (and the CRE outbreak reported by Chang et al  seemingly stopped after this hospital replaced (automated) high-level disinfection of its ERCP endoscopes with EtO sterilization - is whether high-level disinfection can indeed destroy CRE and their related superbugs. A number of studies and published data address this concern. Aumeran et al (2010), for example, report that a peracetic acid-based high-level disinfectant (sold in Europe) was tested and verified to be “fully effective” against a multidrug-resistant strain of K. pneumoniae. Additionally, several intermediate-level disinfectants registered with the Environmental Protection Agency (EPA) in the United States are specifically labeled to destroy CRE within 1 or 2 min[48,49]. Whereas intermediate-level disinfectants are tuberculocidal, high-level disinfectants are even more robust, being both tuberculocidal and, during longer exposure times, sporicidal. It is therefore reasonable to conclude that all high-level disinfectants cleared by the FDA destroy virtually every strain of CRE even more rapidly than intermediate-level disinfectants. Moreover, not only gram-negative superbugs like CRE, but also such gram-positive superbugs as MRSA and VRE are reported to be no more resistant to intermediate-level disinfection (i.e., their destruction does not require a longer time of exposure to the disinfectant) than their antibiotic-susceptible counterparts, carbapenem-susceptible Enterobacteriaceae, “MSSA” and “VSE,” respectively[48,49]. While some of the published data are conflicting, other reports suggest that the development of antibiotic resistance by bacteria does not appear to be correlated with an increased resistance to disinfectants[50,51]. In short, published data suggest that high-level disinfection rapidly kills CRE and their related superbugs. Moreover, to date, there are insufficient data to conclude that cleaning following by high-level disinfection (and thorough drying and proper storage) of GI endoscopes, especially ERCP endoscopes, is inadequate and unsafe for the prevention of transmission of CRE[30,32] (provided the endoscope's design facilitates contact of the disinfectant with all of the instrument's potentially contaminated surfaces), or that EtO sterilization (or a comparable low-temperature sterilization technology) is required to prevent CRE transmissions via a GI endoscope (both the suggestions of the CDC’s report in MMWR in 2014 and Chang et al’s  report notwithstanding). The CDC reported that Hospital X’s aforementioned outbreak of CRE in 2013 was terminated once the hospital replaced automated high-level disinfection of its ERCP endoscopes with EtO sterilization[25,31]. According to one hospital official, as a precaution, Hospital X “moved to (ethylene oxide) gas sterilization for these particular scopes, which exceeds the manufacturer’s recommended cleaning and disinfectant guidelines to ensure no other patients are at risk”. No matter, the CDC does not recommend the EtO sterilization of all ERCP endoscopes, stating in 2014 that: “At this time, CDC recommends facilities reprocess endoscopes as directed by the manufacturer; however, this is a focus of the ongoing assessments. CDC is not recommending a wholesale switch to sterilization; however, facilities should review their endoscope reprocessing practices to ensure all manufacturers’ reprocessing recommendations are followed exactly. Any reprocessing recommendations, including sterilization with ethylene oxide (if recommended), would be validated by the manufacturer”. Consistent with the CDC’s stance, the Society for Gastroenterology Nurses and Associates (SGNA) and the American Society for Gastrointestinal Endoscopy (ASGE) issued a joint statement in 2014, in response to Hospital X’s CRE outbreak the previous year. In that statement both organizations concluded that: “If ERCP-related transmission of CRE is suspected, reprocessing and preventative maintenance procedures for ERCP endoscopes should be evaluated in consultation with the manufacturer of the endoscope and automated endoscope reprocessor, if used”. Their statement adds the following directive: “Please remember to follow the manufacturer’s safety and reprocessing instructions, and don’t hesitate to contact your manufacturer’s representative for any questions related to equipment reprocessing”. In short, neither ASGE nor SGNA currently recommends that endoscope reprocessing practices be revised, upgraded or changed significantly. These practices, which define the current standard of care, include high-level disinfection (preceded by manual cleaning) for the prevention of CRE transmissions during GI endoscopy and other flexible endoscopic procedures. Community-acquired CRE infections? A number of issues surrounding Hospital X’s outbreak of CRE remain unresolved, including its precise cause(s). In addition to Hospital X’s 38 exposed patients who were found to be either colonized (n = 28) or infected (n = 10) with CRE following ERCP, the CDC reported that another 6 patients (44 patients, in total) were also similarly infected or colonized with CRE in northeastern Illinois (United States) between January and December, 2013[25,31], causing this outbreak of CRE to be the largest in United States history, although none of these 6 other patients reportedly received care at Hospital X. Whether any of these 6 infected or colonized patients had been in direct or indirect contact with one or more of Hospital X’s 38 affected patients, demonstrating, possibly, community-associated transmission of CRE, is unclear, but important to evaluate. EtO sterilization: As previously noted, the CDC reported (in MMWR) that no new cases of CRE transmissions due to a contaminated ERCP endoscope were identified once Hospital X replaced the automated high-level disinfection of its ERCP endoscopes (using an AER) with EtO sterilization[25,29,31]. Whether this low-temperature sterilization process is sufficiently robust to overcome, possibly, the hindrances that the ERCP endoscope’s complex physical design reportedly poses to successful reprocessing, or that some other confounding factor altogether was responsible instead for stopping Hospital X’s CRE outbreak, requires more confirmatory data. (No matter, EtO sterilization may be used by a healthcare facility as one of several “bundled” interventions concomitantly implemented to terminate a CRE outbreak. Circumspection is recommended, however, as no device that uses EtO gas has been cleared by the FDA with the specific intended use to sterilize ERCP endoscopes). Also previously noted, Bernie et al (1983) recommended, and Chang et al (2013) implemented, EtO sterilization to prevent transmission of the HBV via a GI endoscope and of CRE via a ureteroscope, respectively. The conclusion suggested by the CDC that the ERCP endoscope’s complex physical design - including that of its forceps elevator (Figure 1B), which presumably hindered reprocessing - was a primary contributor to, if not the cause of, Hospital X’s CRE outbreak also requires more confirmatory data. CRE-contaminated water? Hospital X’s use of EtO sterilization for the apparent termination of its CRE outbreak in 2013 intriguingly raises another unresolved issue: that, possibly, a hitherto overlooked factor might have contributed to or caused this outbreak - namely, one that Muscarella (2010) has previously discussed as a risk factor for other, similar instances of transmissions of multidrug-resistant bacteria during GI endoscopy: contaminated tap water. Because the CDC’s report in MMWR does not discuss whether Hospital X’s environmental surfaces, including its tap water or the AER’s rinse water (or, too, the AER’s internal components and water filters), were microbiologically sampled for contamination with CRE, there remains the possibility that the water supply (or another related moist or wet environmental surface, such as a sink) used by Hospital X to rinse its ERCP endoscopes following high-level disinfection might have been contaminated with the outbreak’s strain of CRE (i.e., NDM-1-producing E. coli). Indeed, contaminated rinse water used during endoscope reprocessing, coupled with inadequate drying of the ERCP endoscope’s internal channels after terminal water rinsing, is a commonly documented contributor to bacterial transmissions via contaminated GI endoscopes[2,7,8,11,12]. For certain, in addition to a human’s GI tract, water (and soil) is a documented reservoir of CRE[2,44,45,51-54]. That another unrecognized factor altogether may have been the primary cause of (or a contributor to) Hospital X’s CRE outbreak also remains plausible. [Note: CMS’s inspection report of Hospital X raises the possibility, in addition to the two strains of CRE that the CDC recovered from one of Hospital X’s contaminated ERCP endoscope (i.e., NDM-producing E. coli and KPC-producing K. pneumonia), that a third strain of CRE - namely, NDM-producing K. pneumoniae - might also have infected or colonized at least one patient (i.e., “Patient #10”) who underwent ERCP during the time of Hospital X’s outbreak and who subsequently expired]. Faulty reprocessing? According to the CMS’s aforementioned health inspection report published in 2014, in the aftermath of Hospital X’s CRE outbreak, the manufacturer of the implicated ERCP endoscope model asserts that Hospital X did not clean its ERCP endoscopes as their labeling instructs. First, instead of it using the cleaning brushes specifically designed, validated and “highly recommended” (but not necessarily required) by the ERCP endoscope’s manufacturer, this inspection report states that Hospital X used another manufacturer’s brushes to clean its ERCP endoscopes (i.e., a claimed “off-label” practice). Second, this inspection report also indicates that Hospital X used an enzymatic detergent to clean the implicated ERCP endoscopes that had not been “approved” by the endoscope’s manufacturer and confirmed to be compatible with the materials used in the endoscope’s construction (i.e., another claimed “off-label” practice). The extent to which Hospital X’s failure to use either the specific type of cleaning brushes or a detergent recommended or approved by the ERCP endoscope’s manufacturer, respectively, contributed to Hospital X’s CRE outbreak is unclear. Patient mortality linked to GI endoscopy: Of Hospital X’s 38 patients who were exposed to the outbreak strain of CRE while undergoing ERCP in 2013, 28 patients became colonized and 10 infected, with two of these 10 infected patients subsequently dying. Whether the outbreak’s strain of CRE was the primary cause of these deaths, only contributed to them, or was incidental is subject to professional judgment and both clinical data and debate. Whichever, the fact that two of Hospital X’s 10 CRE-infected patients died following their exposure to one of three contaminated ERCP endoscopes is an additional testament, not only to GI endoscopy now being a confirmed risk factor for CRE infection, but also to the importance of reprocessing every one of the GI endoscope’s potentially contaminated surfaces and areas following its use, lest the instrument remain contaminated and transmit CRE or their related superbugs, with associated morbidity and mortality. Several recommendations are provided to prevent transmissions of CRE and their related superbugs during GI endoscopy (and other types of flexible endoscopic procedures). For example, strict adherence to the cleaning instructions provided by the GI endoscope’s (or the AER’s) manufacturer, especially the instructions for brushing the area around, near and behind the forceps elevator located at the distal end of the ERCP endoscope (Figure 1B), is emphasized. More frequent monitoring of reprocessing staffers to verify the proper reprocessing of GI endoscopes, particularly ERCP endoscopes, is also recommended. High-level disinfection, whether achieved using a FDA-cleared aldehyde-based disinfectant or an oxizing agent, remains the recommended standard of care and can be expected to destroy CRE rapidly. Use of EtO sterilization for processing GI endoscopes, in lieu of manual or automated high-level disinfection, is neither contraindicated nor required (except, possibly, as part of an initial and “bundled” response to terminate a CRE outbreak). Enhanced surveillance designed to identify CRE infections and colonizations quickly and proactively, such as the screening of patients (e.g., rectal or perianal swabbing to detect gastrointestinal carriage of CRE) upon admission, warrants consideration. A number of other interventions intended to prevent CRE transmission are provided below. Review of other published articles that provide additional guidance for the prevention of transmisson of all types of infectious agents during GI endoscopy is encouraged[3-6,14,47,55-58]. Standard precautions are important to the prevention of CRE transmissions in the GI endoscopic setting. For example: (1) practice proper hand-hygiene etiquette consistent with the CDC’s guidelines; (2) don personal protective equipment (PPE), wearing gloves, gowns, and a face mask, as needed; and (3) in addition to high-level disinfecting (or sterilizing) GI endoscopes (and other semi-critical devices), sterilize reusable critical items, such as reusable biopsy forceps, and regularly clean and disinfect (using a low- or intermediate-level disinfectant) both non-critical devices, such as stethoscopes, and environment surfaces, such as countertops, as prescribed by the CDC’s guidelines (i.e., ideally, using an EPA-registered, hospital-grade disinfectant labeled to rapidly kill CRE for those surfaces potentially contaminated with these superbugs). Moreover, the prevention of CRE transmissions will also likely require the implementation of Contact Precautions for patients infected or colonized with CRE, cohorting these patients and the healthcare staff treating them as deemed necessary. A number of recommended practices for the proper reprocessing of GI endoscopes that are based on this article’s findings are provided in Table 3. Recommended practices include placing emphasis on the cleaning and complete brushing (prior to high-level disinfection or sterilization) of the area of the ERCP endoscope near, around and behind its forceps elevator (Figure 1B), as well as flushing this endoscope’s elevator wire channel (if it is exposed and unsealed) with detergent using a procedure validated for effectiveness. The use of cleaning accessories, including brushes and detergents, recommended and validated by the GI endoscope’s manufacturer may prove to be important. Efforts by healthcare professionals to educate themselves on the epidemiology of CRE and related superbugs; their modes of transmission; their common sources and reservoirs; and their mechanisms of resistance to carbapenems and other antibiotics are encouraged as part of a broad program to prevent CRE transmissions during GI endoscopy. Better stewardship and the reduced or restricted (and more judicious) use of antimicrobial drugs for the treatment of patients infected with CRE and their related superbugs is recommended as a corrective action to slow, if not to prevent, the development of antibiotic-resistant infections. And, of course, failure to adhere to strict aseptic techniques during the administration of iv medications used during GI endoscopy poses a significant risk of viral (and bacterial) transmissions. Attention by manufacturers of GI endoscopes to perform, in addition to performance testing and other regulatory requirements, enhanced risk assessments and other quality, safety and design-control strategies that assess the likelihood of CRE transmissions; evaluate the potential impact of these transmissions (which can be significant) on patient safety; mitigate further the risk of these transmissions (and other patient harms) during GI endoscopy - for example, by enhancing endoscope designs to optimize thorough cleaning and complete reprocessing; and, by updating the endoscope’s reprocessing manuals to provide even more detailed cleaning instructions using even better performing cleaning brushes and detergents; and validate the success of each corrective and preventive action (or mitigation) developed and employed to prevent these transmissions via a GI endoscope is encouraged. Indeed, because of the possibility that the FDA’s regulatory oversight of manufacturers of GI endoscopes and related instrumentation - like closer scrutiny, too, of the infection-control and endoscope-reprocessing practices of surveyed GI endoscopy departments by healthcare accrediting organizations and state health departments - may increase as a consequence of several recently disclosed CRE outbreaks (see text, above, and Table 4), it may prove prudent for both manufacturers and GI endoscopy departments alike to place enhanced focus on quality activities specifically designed to prevent CRE transmissions during GI endoscopy. Not to be overlooked is the importance to public health of trending and surveillance activities, and, respectfully, of both manufacturers and healthcare professionals filing prompt and complete reports about an identified CRE outbreak (linked to a medical device) with the FDA via its MAUDE database (Table 4). This article answers several questions posed in Table 1 about CRE, their related superbugs, and the risk of transmission of these multidrug-resistant bacteria during GI endoscopy and other flexible endoscopic procedures. Not only are they an emerging public health threat (Table 2) both globally and in the Unites States, but this article identified GI endoscopy to be a risk factor for infection and colonization with CRE and their related superbugs (as well as with other types of antibiotic-resistant bacteria; antibiotic-susceptible bacteria, too; and other infectious agents, including viruses), with associated morbidity and mortality. Strict adherence to infection control in the GI endoscopic setting is necessary to ensure patient safety and prevent disease transmission. To date, high-level disinfection appears sufficient to prevent a GI endoscope from transmitting CRE and their related superbugs (provided the disinfectant contacts all of the endoscope's surfaces contaminated with CRE). Nonetheless, EtO sterilization of ERCP endoscopes may be employed prophylactically or once CRE transmissions have been confirmed (unless it is contraindicated by the GI endoscope’s manufacturer), although the effectiveness of this low-temperature sterilization process for the prevention of CRE transmission is based on clinical data and reports, not necessarily rigorous simulated-in use validation studies that have been reviewed by the FDA. Special attention is placed on healthcare staff assuring thorough cleaning of the ERCP endoscope (Figure 1B), especially the area around, behind and near its forceps elevator (and, if exposed, the flushing of its elevator wire channel with a detergent validated for effectiveness and materials’ compatibility). Additional recommendations are provided in Table 3. At the time this article was published in October, 2014, the CDC had just published a more comprehensive review of its investigation of Hospital X than it provided in MMWR earlier in January, 2014[25,69]. (The reader’s review of this more recent CDC report is recommended). Moreover, on October 9, 2014, the University of Pittsburgh Medical Center (UPMC) reported that after having identified an “uptick” of antibiotic-resistant infections (i.e., an outbreak of CRE) in patients who underwent ERCP in 2012, the hospital changed its practices from high-level disinfection of ERCP endoscopes to ethylene oxide gas (EtO) sterilization. According to UPMC, the “normal process” (i.e., high-level disinfection) “failed to eliminate all bacteria” (presumably, from the ERCP endoscope’s elevator wire channel). Whether the hospital and/or one or more manufacturers (i.e., of the ERCP endoscope and, if one were used, the automated endoscope reprocessor, or AER) filed a report with the FDA documenting these CRE infections in the Agency’s MAUDE database, like whether this outbreak at UPMC is one of the MAUDE reports listed in Table 4, is unclear. [A related, timely, and closing note: In response to its current outbreak in certain regions of the world, patient-to-patient transmission of the Ebola virus via properly disinfected or sterilized reusable medical instrumentation has not been reported].